100 years ago today the White Star Line announced the departure date for RMS Titanic‘s maiden voyage. The National Archives is holding a one-day conference at Kew to commemorate the centenary of RMS Titanic. The programme looks at all aspects of Titanic in its historical setting, from the building of the ship to the aftermath of its sinking. Speakers include specialist staff from The National Archives, academics, published authors and Titanic experts. They will take you through the history of the ship, from its construction and launch to its fateful end, each talk providing a unique angle. 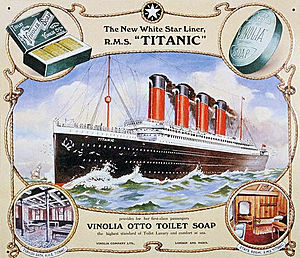 There will also be a special Titanic exhibition in our museum throughout spring 2012. Places are limited and are available on a first come, first served basis so book early to guarantee your place. Book before 31 October 2011 to save £10 off the ticket price with our early bird discount. This entry was posted in Research resources and tagged Genealogy, Kew, Maiden voyage, National Archives, RMS Titanic, Ship, Titanic, White Star Line. Bookmark the permalink.